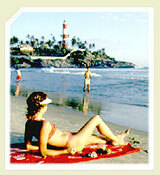 Royal Wheels India is an adventure travel group organising Kerala Beaches Tour Packages. 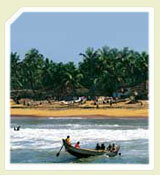 Kerala coastal area is made up of the river deltas, backwaters and the shore of the Arabian Sea. 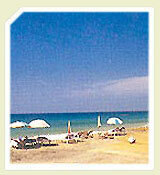 It has a 600-kms long shoreline dotted with the finest coconut groves and charming beaches of India. 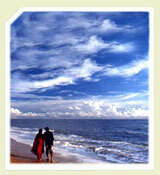 The beaches of Kerala are renowned the world over for their breathtaking beauty. The blues of the sky and the blue waters of the beaches of Kerala come together to take away your blues. It is 16 kms from Thiruvananthapuram city. 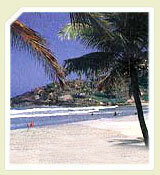 Kovalam is internationally renowned and it consists of three adjacent crescent beaches. The southernmost, 'Lighthouse Beach', is the most popular one. It is 41 kms from Thiruvananthapuram city. It is a seaside resort as well as an important Hindu cente of pilgrimage. The 2000 years old Sree Janardhana Swamy Temple and the Nature Care Centre are the two main attractions worth visiting nearby the beach. It is 5 kms from Kollam town. The beach stands on the ruins of an old Portuguese Fort and Churches built in the 18th century. It is 45 kms from Ernakulam city. It borders Bypeen Island, and is ideal for swimming. Dolphins are also seen here quite often. Situated in Malappura District, it was one of the earliest settlements of the Portuguese. St. Francis Xavier visited the place in 1546. One of the oldest temples in Kerala, Keraladeshapuram Temple dedicated to Lord Vishnu is situated in 3 kms south of Tanur town. 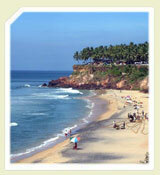 This beach offers a breathtaking view of the confluence of the Bharathapuzha, the Tirur Puzha and the Arabian Sea. It lies 10 kms south of Kozhikode city. 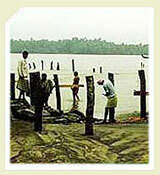 The beach is situated at the mouth of the Chaliyar River. Famous for the construction of the Uru, the traditional, Arabian trading vessel, it was once most sought after place for merchants from Western Asia, for its ship building industry. It is 16 kms from Kozhikode city. 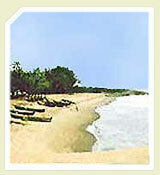 Kappad Beach is a historic beach where Vasco da Gama landed on the 27 May, 1498 with 170 men in three vessels.